Steel grating is a metal structure with welding or pressure locked. We mainly introduce processing and major parameters of the two types of steel grating (welded and locked). Steel grating is a kind of square opening steel structure welded or plugged with flat-rolled steel and cross bars lined and crossed with certain spacing. 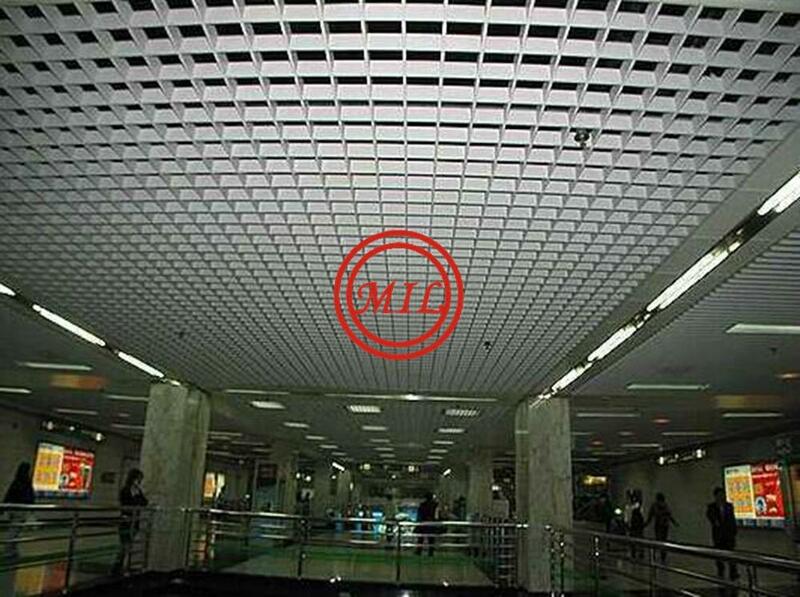 Steel grating has good ventilation, lighting, cooling, slip-proof properties. Mainly used to make steel structure platform plates, steel ladder treads, steel grating fence and drain covers and so on. Steel grating can be divided into two major types according to processing methods: pressure welding and pressure locked. ① Flat-rolled steel: high quality low carbon steel, stainless steel, aluminum alloy steel. ② Cross Bar: Q235A or optional 304 stainless steel twisted steel, square steel, round steel, flat steel. 2:Flat Bar Surface Shape: flat, serrated, I -shaped, toothed. b Height: commonly 25mm, 30mm, 32mm, 40mm, 45mm, 50mm, 60mm and so on. 4.Flat Bar Spacing: Two adjacent center bearing bar distance , commonly three sizes: 30mm, 40mm, 60mm. Dense steel grating spacing is less than 25mm. 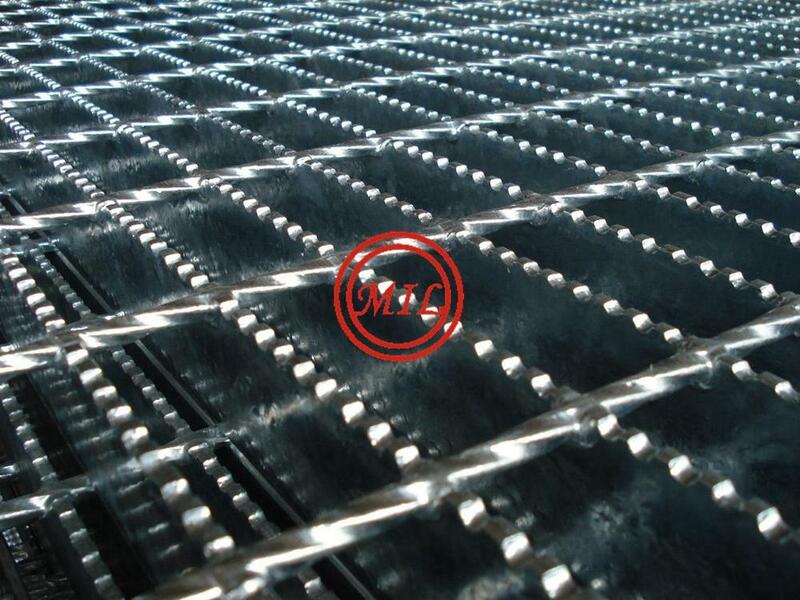 Steel grating is mainly used for demanding applications. 5. 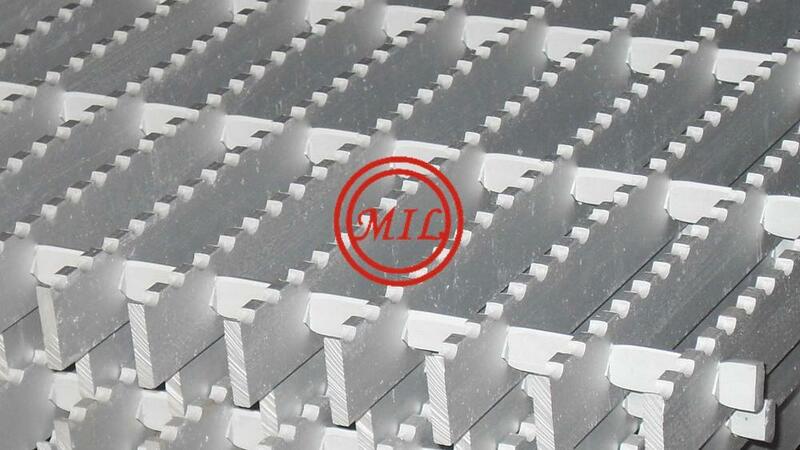 Cross Bar Specification: common specifications: 5 × 5,6 × 6,8 × 8mm. 7. 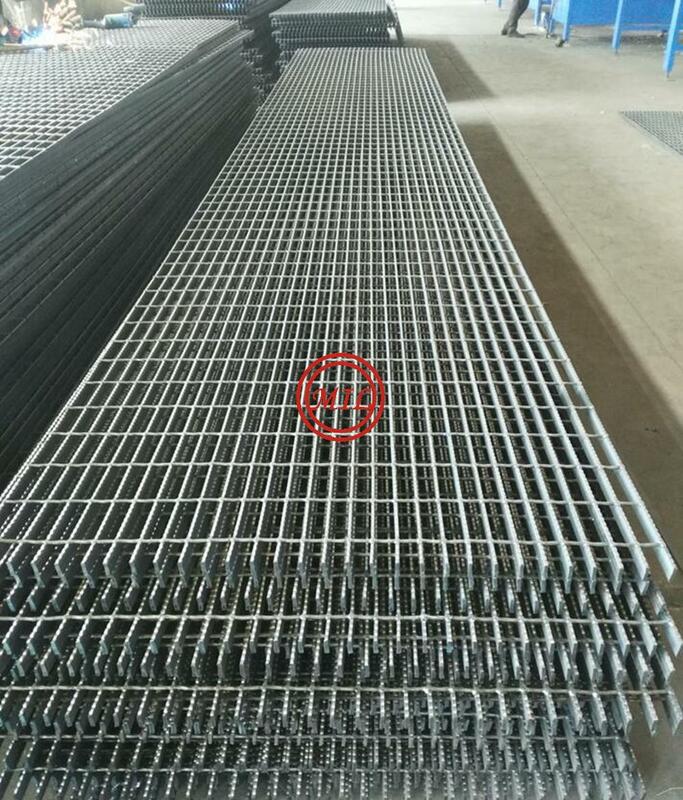 Length of Steel Grating Panel:. 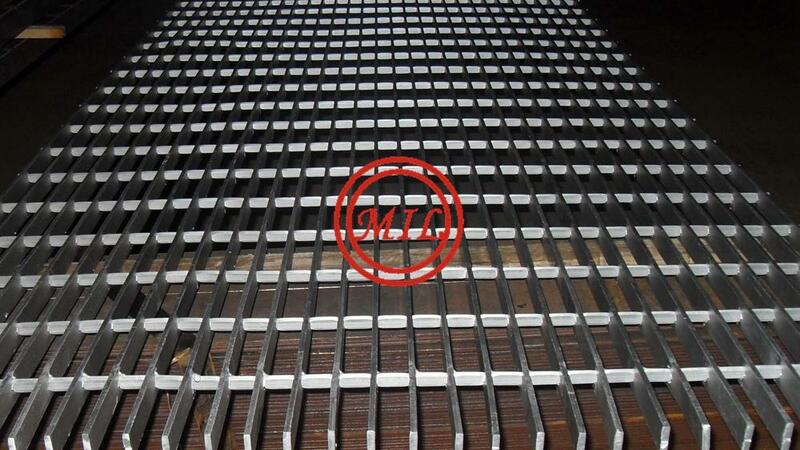 General steel grating length ≥ 800mm. Trench cover for large span platform has a length of 3000-10000mm. 8. Surface Treatment: Electro-galvanized, hot galvanized , painting, dipped rust-proof oil. These treatment can play a role in preventing oxidation. ① Strap Packaging: Generally for relatively common shape steel grating . ② Pallet Packaging: General packing for export. ③ Screw Rod Fixation: Using four screws through the steel grating aperture, locking screw packaging method . Bundled neatly packaged steel grates with a packing strap, steel grating packed into pallet, steel grating packed with screw locking rod, steel grating packed with screw locking rod. 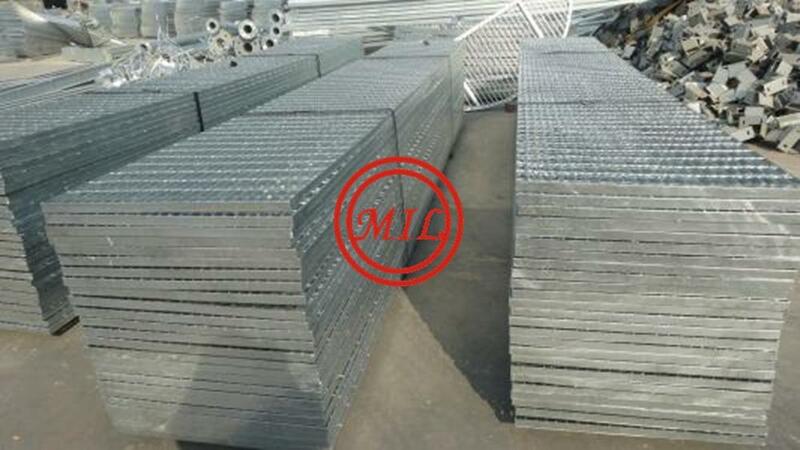 The crossing bar of standard pressure lock steel grating bar is usually 20 × 5mm flat steel ( or other specifications ) , pushed by strong pressure into the bearing flat steel. The jointing spots between flat steel bars are locked by the pressing force yielded through deformation. The steel bar can be made of ordinary steel, aluminum or stainless steel. 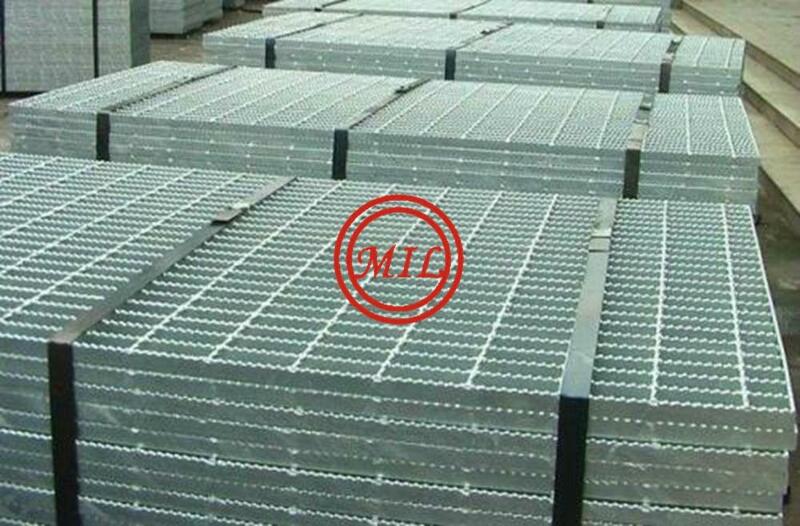 Pressure Locked Steel Grating Type: Total four types: ordinary type, the integral type, shade -type , heavy-duty. ① After bearing flat steel bar grooving, the crossing flat steel bar pressure locked. ② Ordinary steel grating maximum working height: 100mm. 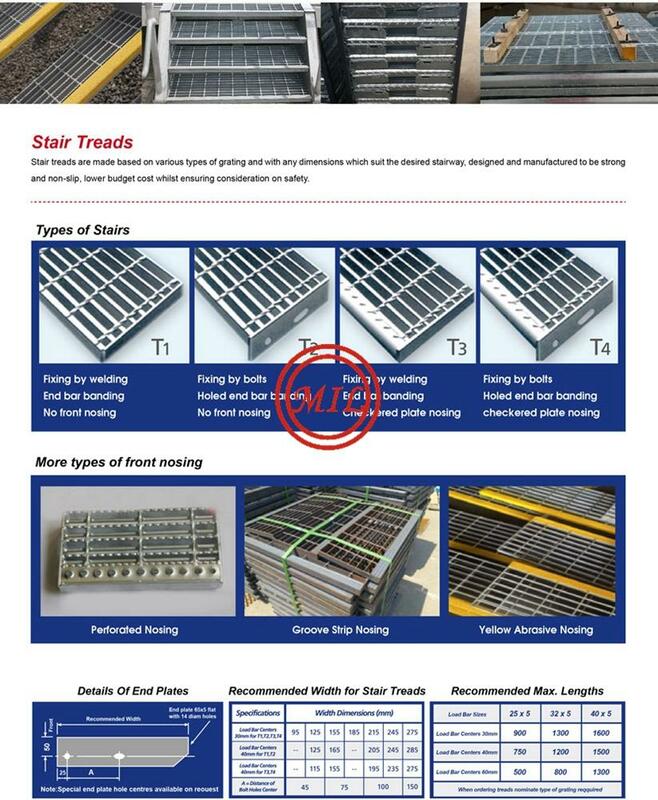 ③ Steel grating length is usually less than 2000mm. ① Flat bearing flat steel bar and crossing bars have the same height, grooving depth is 1/2 of that of bearing flat bar. 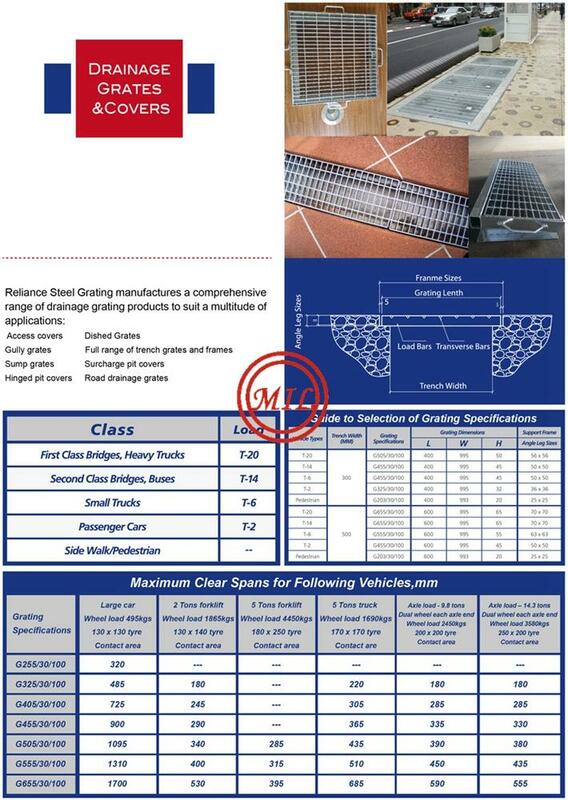 ② Steel grating panel height: max. 100mm. 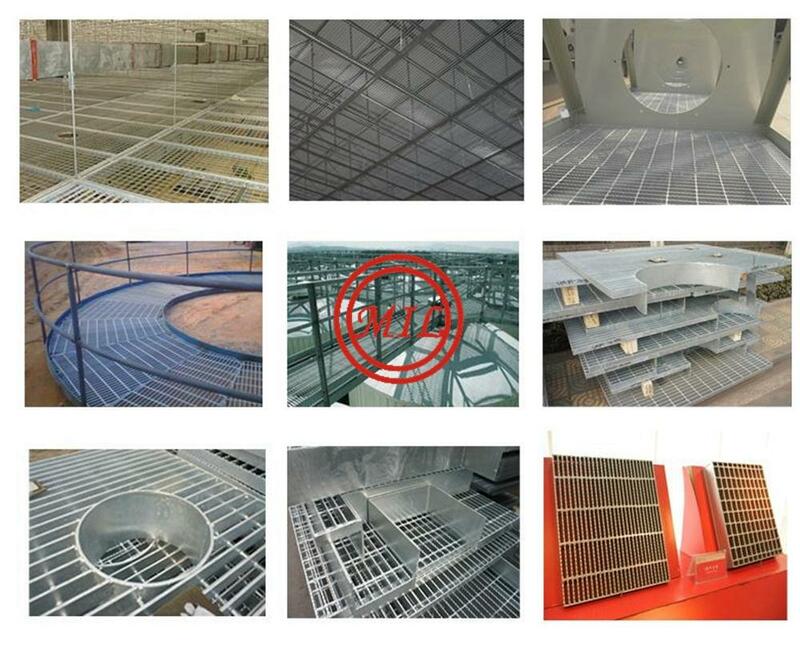 ③ Steel grating panel length is usually less than 2000mm. ① Flat bearing bar grooving at 30°or 45°, then pressure locked. 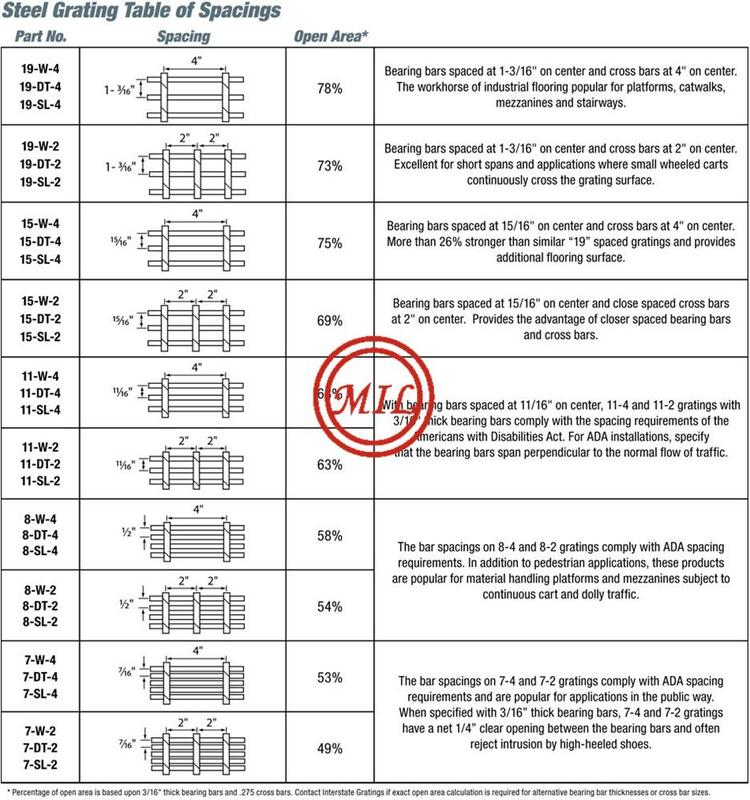 ② Other spacing and specifications according to different needs. ③ Grating panel height is less than 100mm. ② The bearing flat steel bar and the crossing bar pressure locked under pressure of 1200 tons. ② Suitable for big span heavy loading applications. 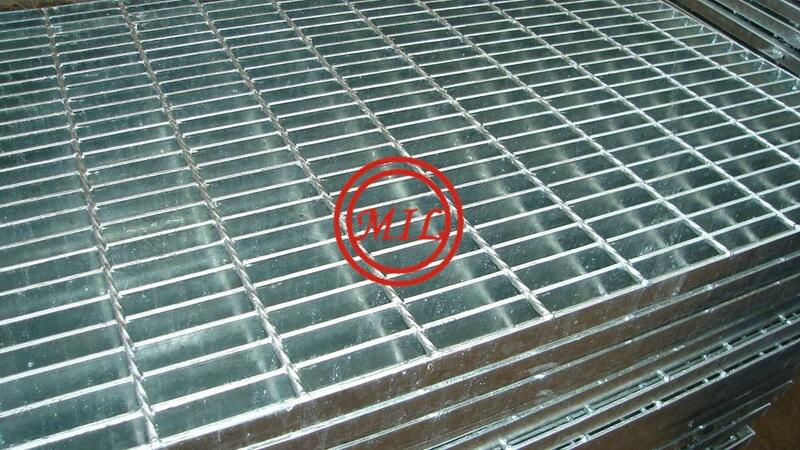 Steel grating is perfect for factories, buildings. generating plants; in fact anywhere the ease of movement and safety is required. With steel grating quick fitting accessories, ease of cleaning, safety and strength will provide you with the economical answers to lots of applications. Because of its robust design and spanning abilities, steel grating is very strong and safe for the support of floors and elevated walkway. Flat bars can be made from steel strip or slit sheet or from rolled. Serrated type grating offers users a slip-free surface. It is available with most of the standard bearing bars. An extruded bearing bar having a cross sectional shape resembling the letter "I". Press-locked steel bar grating is often desirable because its smooth look, clean and excellent support. It exhibits the same strength, long life and openness as welded grating. Materials include mild carbon steel and stainless steel. It is also available in a serrated surface for extra safety. Spacing range can be custom designed to meet the requirements. This method of manufactureing is particularly flexible that it allows for the production of grating with custom bearing bar spacing. Small quantities can easily be manufactured to suit the precise needs of most applications. Mild carbon steel provides an economical, high strength for uses in most industrial and commercial applications. The load bearing bars are produced from steel which conforms to the following equivalent standards: JIS G3101 SS400 or ASTM A36 or equivalent. Stainless bar grating is a choice for corrosive environments such as chemical, food and hydro processing areas. It is available in welded and press locked as well as in many bearing bar sizes. The most common material is Type 304 (SUS304), however, Type 316 (SUS316) or Type 316L (SUS316L) is also available. 304 stainless steel is the most popular type contains both chromium and nickel to provide excellent balance resistance and workability. 316 stainless steel is better corrosion, pitting resistance and higher strength at elevated temperatures than 304. 316L is extra low carbon variation of 316 to avoid carbide precipitation due to welding. 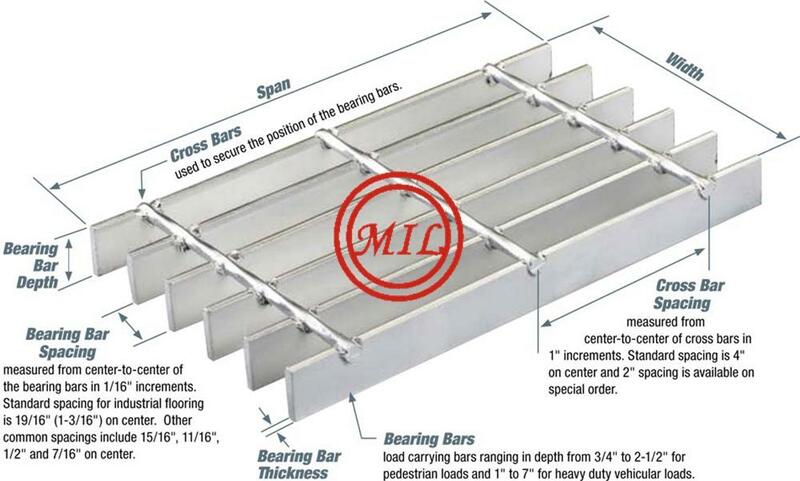 Allowing quicker delivery to customers whom fabricate and galvanize the grating on their own. Hot Dip Galvanizing can give a hygienic and clean maintenance free bright finish. The minimum average hot dip galvanized is coated as required by Standards AS1650, BS729 and ASTM A123. Steel plates welded on certain flat steel bar and spacing with the high-pressure welding machine welded together is called steel gratings. The cutting, incision, opening, the package-processing procedures are necessary as customer demand for the finished product. Its characteristics include high-intensity and light structure. The grid is a firmly welded steel bar structure with a high capacity, light structure, easy loading and other characteristics like aesthetic appearance. The hot-dip zinc surface treatment gives it a good anti-corrosion capacity, shiny surface appearance and durability for uses. It is suitable for places and sites requiring ventilation, explosion proof, lighting resistance, heat resistance materials. Widely used in the petrochemical industry, power plants, waterworks, sewage treatment plants, municipal works, sanitation projects in areas such as platforms, corridors, bridge, ditch cover, well covers, ladders, fences, rails, and so on. 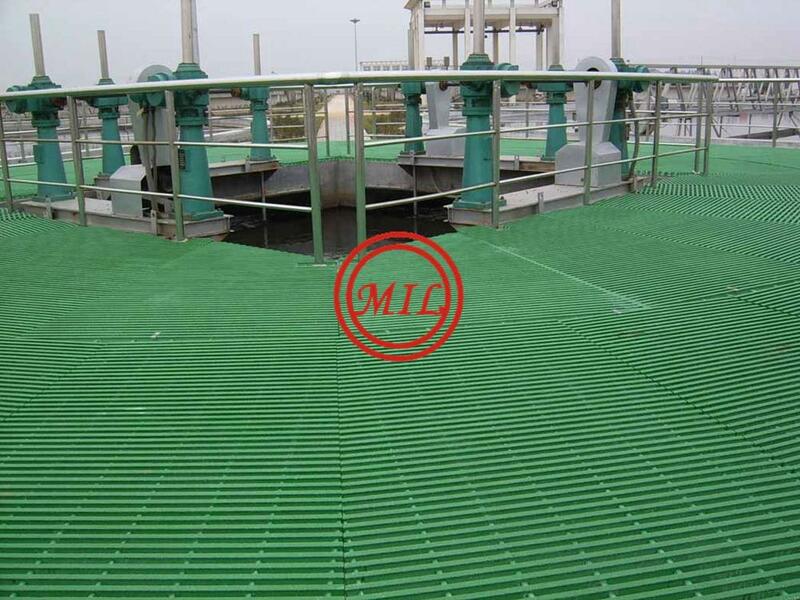 Pressure lock steel grating is a kind of high strength grating. It is a product featuring unique combination of uniformity and precision. It has light structure, elegant style, beautiful and natural design and it is maintenance-free. Press-locked steel grating is used in civilian and commercial buildings, theatres, subway, suburban railway, and other municipal engineering. It exhibits the same strength, long life and openness as welded grating. Materials applied include mild carbon steel and stainless steel. It is also available in a serrated surface for extra safety. 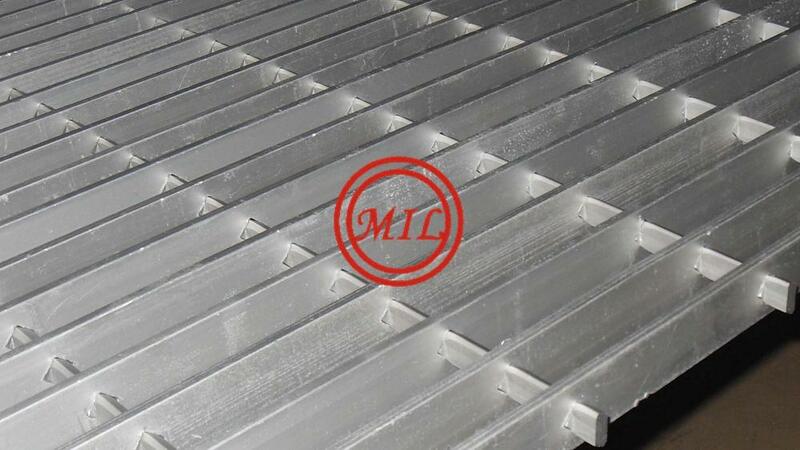 aluminum grating is designed to be a high-strength, low-weight product that uses an I-bar or rectangular bearing bar with cross rods hydraulically swaged under high pressure. Thus, giving you a rigid, virtually maintenance-free flooring product. Similar to steel grating, aluminum grating can be pressure locked as an alternative to swage locked. This application process also allows the customer to choose a close mesh grate where certain special needs are to be met. Our fiberglass grating is available in molded and pultrusion styles. Molded grating is manufactured by interweaving continuous glass filaments which are impregnated with a thermosetting resin. Up to five grid patterns are available in panel sizes 3’ x 10’ and 4’ x 12’. Pultrusion is a continuous molded process in which glass roving and matting are pulled through a vinylester or polyester resin bath. Standard panels are 4’ x 4’, 4’ x 10’, 4’ x 12’, 4’ x 20’, 3’ x 10’ and 3’ x 20’. The molded and pultrusion grating styles are available with anti-skid surface, fire retardant corrosion resistant, U.V. protected, non-conductive and are lightweight. Additionally, we offer fiberglass structural shapes produced in more than 100 configurations. Fiberglass structural shapes are widely used in industrial construction, maintenance, as components for industrial equipment, and commercial products. Height of Bearing Bar (H). 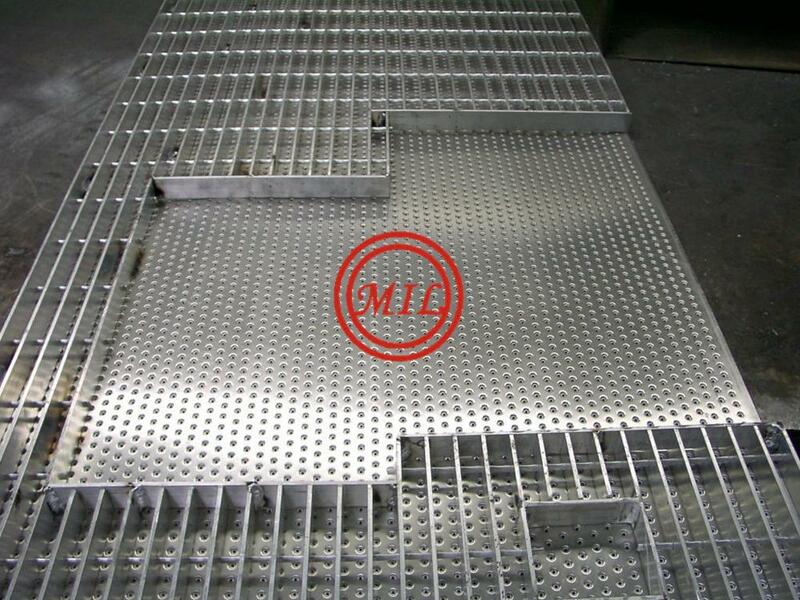 Standard Welded Bar Grating: Used universally for walkway and mezzanine decking applications. Ideal for most commercial and industry uses. Close-Mesh Bar Grating: Suitable for applications requiring narrow spacing for aesthetic or functional reasons. 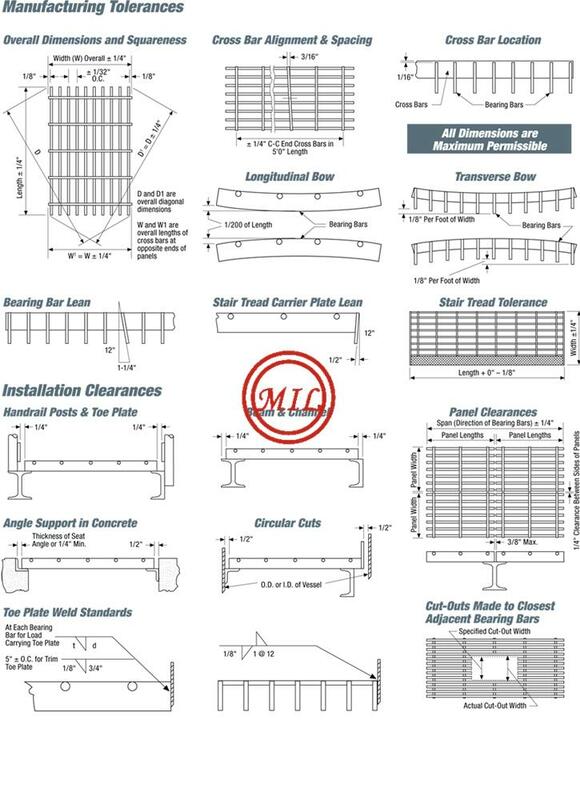 Railroad Grating :Designed specifically for use as railcar brake steps, running boards, walkways and platforms. Heavy-Duty Grating:Using thicker and deeper bearing bars, this grating is used commonly for airfields, highways, industrial floors, ramps, docks, reinforced concrete areas and specialty applications. Press-Locked Steel Bar Grating & Aluminum Bar Grating: A smooth clean look that is ideal for applications such as grilles, dividers and screens. Swage-Locked Aluminum Bar Grating:Manufactured with either an "I" or rectangular bearing bar, these bars are permanently locked to the cross rods with a swaging process which reshapes the rods. Aluminum Planks:Available in unpunched, square punched, or rectangular punched styles, these planks are styled to suit lighting and ventilation considerations as well as providing continuous walking safety for additional safety.